Safely recharges batteries faster than competing products. Significantly increases battery life and cuts risk of sudden battery failure. Simplifies inventory management & field service. Easily enable genset, workboat & building integration. The MicroGenius®2 Intelligent Battery Charger combines the legendary reliability of SENS’ NRG with advanced charging features and all a new battery life-extending technology called HELIX™. These versatile battery chargers pack advanced technology charging into a small, lightweight and rainproof package, perfect for mission-critical applications. MicroGenius®2 is the only charger that delivers patented high performance charging, known as Dynamic Boost™, while prolonging useful life of batteries and significantly reducing risk of sudden battery failure. The small, rugged package is ideal for power generation, marine and reserve power applications. 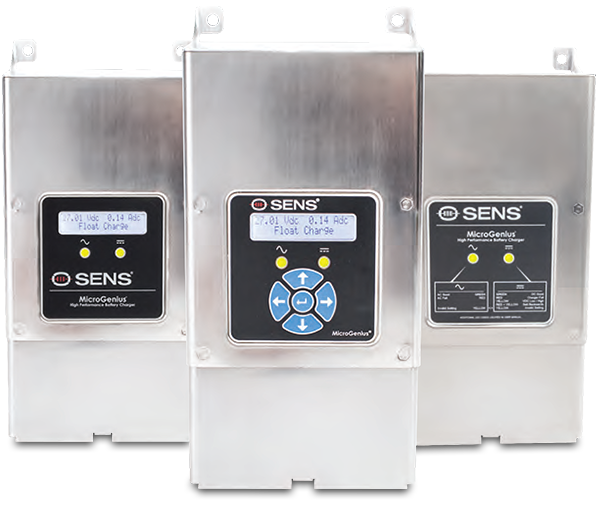 SENS engineered MicroGenius®2 chargers for use in multiple applications Engine Starting, Marine Power, and Standby / Power Supply operation. By employing a powerful, state-of-the-art digital signal processor, we are able to configure charging profiles and alarms to ideally fit each of these applications. MicroGenius®2 supports all standards battery types: Flooded lead-acid, maintenance free flooded-lead acid, AGM, VRLA and NiCd. 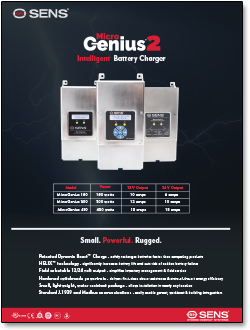 MicroGenius®2 battery chargers combine the most advanced technology ever applied in their product class with SENS’ widely acknowledged expertise in designing and building the industry’s highest quality, most reliable products. They employ an advanced high frequency power converter controlled by a powerful digital signal processor (DSP). This converter delivers up to 50% more power in ¼ the volume and at 1/8th the weight of previous generation products. These chargers are built for tough genset and marine duty. The tough die-cast chassis provides reliable convection cooling in hot environments — no fans to fail or pump dirt into the charger. And since the MicroGenius®2 operates at higher efficiency than competitive units (93% peak efficiency, < 3 watts in Eco-Float mode), there’s less waste heat to dissipate. Specify the charger that does everything well. For SENS, sustainability means not only creating products that conserve our natural resources, but also delivering long-lived products that perform the tasks for which they were designed exceptionally well. MicroGenius®2 chargers are engineered to last longer than competitive units. Long-lived products also provide economic sustainability, enabling resources to be deployed for new capabilities instead of being used to replace existing functionality. These chargers use the industry’s most ecology responsible construction, lead the industry in efficiency, and meet the California Energy Commission’s (CEC) battery charger efficiency requirements. Installation of both enclosed and open-frame models of the MicroGenius®2 is easy. All models tolerate temperature extremes and vibration. All models have universal AC input, so chargers automatically accept any voltage between 100VAC and 240VAC nominal at either 50 or 60Hz. 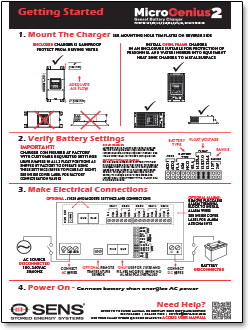 See the Quick Start Guide and User Manual for detailed information. 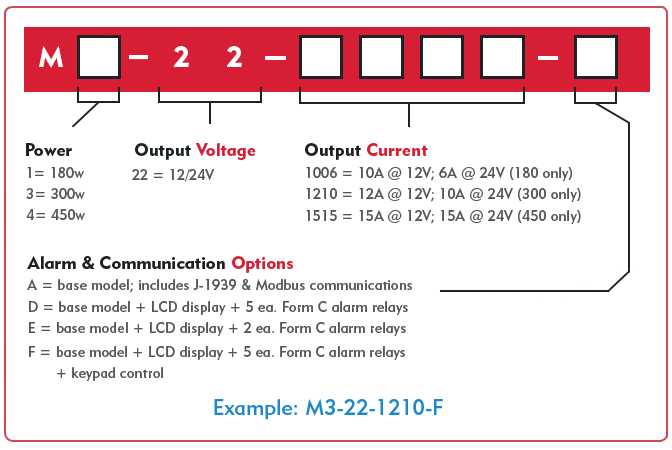 The MicroGenius®2 Setup Utility enables advanced users to make fine tune adjustments to charging voltages, alarm thresholds, charging algorithms, and even change alarm relay assignments. The software runs on Windows® PCs (Windows® 7 and later) and is available on the SENS website. 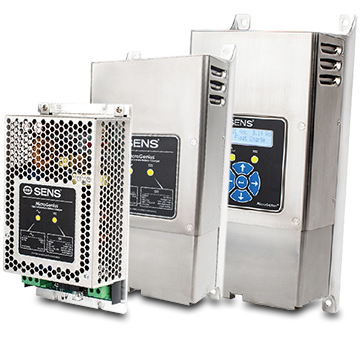 Click here to purchase the SENS MicroGenius®2 Intelligent Battery Charger from the MurCal web store.